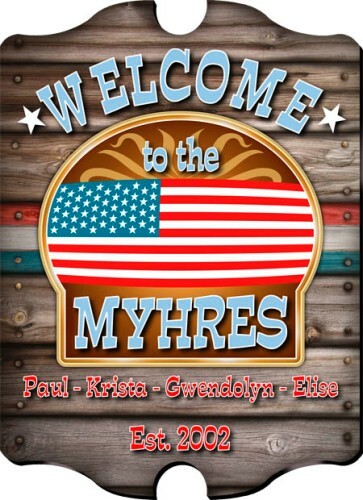 Greet your guests with a little touch of Americana with our Personalized Welcome Sign. This patriotic sign prominently features the American Flag and family name and the distressed wood-grain background gives a sense of warmth. Measuring 10 3/4" x 15 1/2" x 1/4", the sign is printed on a composite wood base and comes ready to hang. Personalized with First Names, Family Name and Established Year.